Long story short, I moved a lot of food from fridge to fridge and realized how much stuff gets pushed aside and neglected. There was a teeny bit of strawberry jam left in a big jar. This is what I did with it. It was absolutely delicious and you should make it with whatever jam you've got hanging about in your fridge! In a small bowl, whisk together the flour, brown sugar, spices and salt. 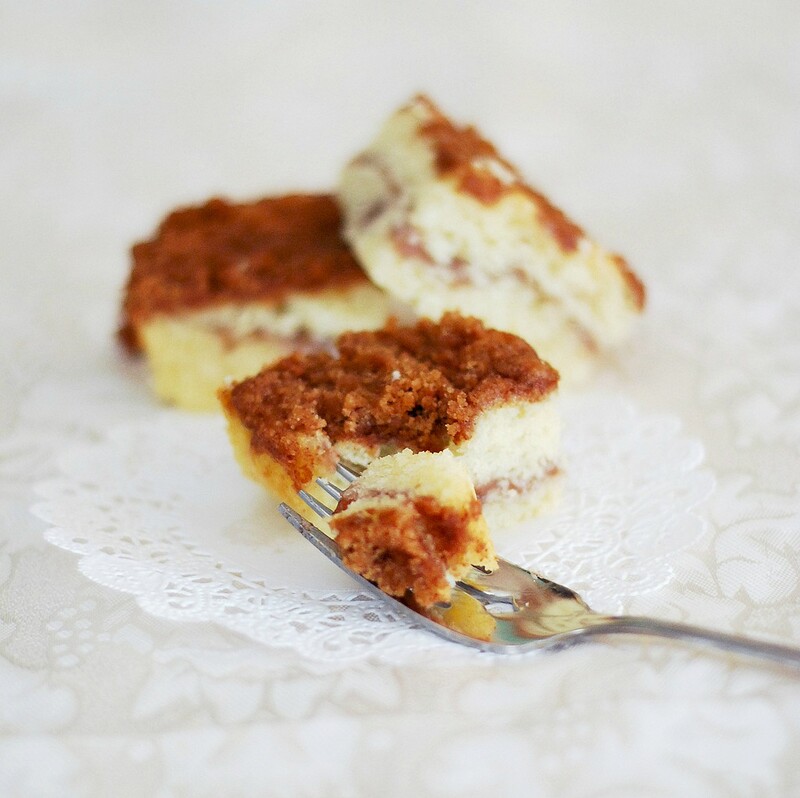 Using a fork or two knives, cut the cold butter into the dry mixture until crumbs form. Set aside while you make the cake batter. Preheat the oven to 350 degrees F. and grease an 8x8" square baking dish with nonstick cooking spray. In a small bowl, whisk together the flour, baking powder, baking soda and salt. In a larger bowl, cream together the butter and sugar, then add the egg. Add the dry ingredients and milk alternately, beginning and ending with the dry ingredients. Scrape half of the batter into the prepared pan and spread evenly. Spoon dollops of the jam over the batter and spread it as evenly as you can, then top with the rest of the batter. (I found a small off-set spatula was perrrrfect for this!) Sprinkle the reserved crumb mixture on top and bake until a toothpick inserted in the center comes out clean, about 30 to 40 minutes. Let cool completely before cutting into squares. Stored at room temperature, this cake keeps for 3 days. 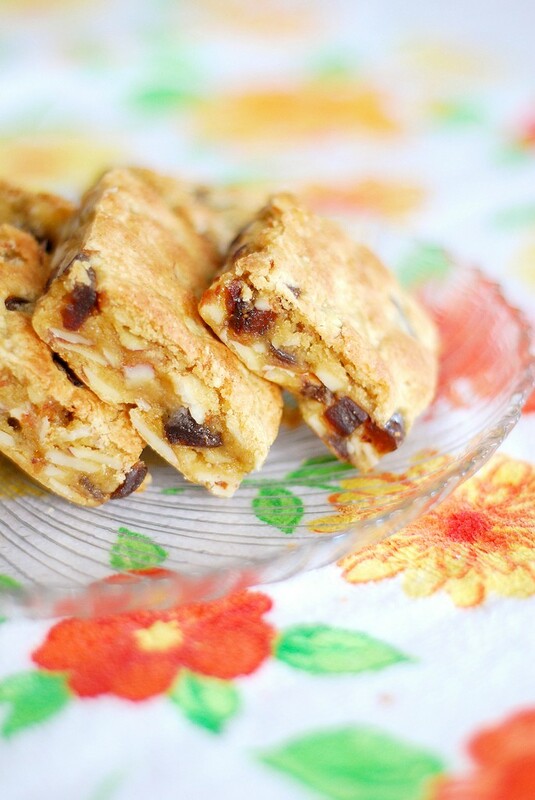 Chewy Date and Nut Bars. These happened because I realized I only had 3 sticks of butter left in the fridge and panicked, but I loved them so much that I'd make them even if I had 3lbs. left! 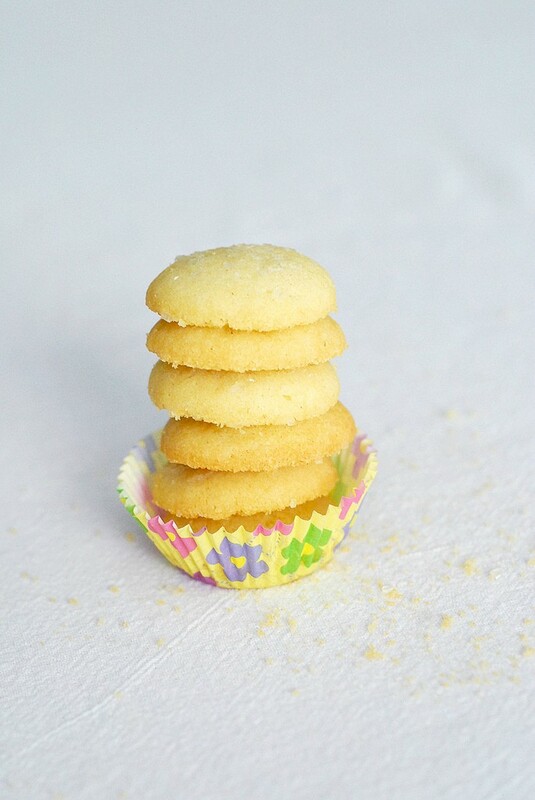 You'd never know there wasn't any butter in these cookies, I swear! If you're a chewy fan, you must preheat the oven now. Preheat the oven to 400 degrees F. and line an 8x8" glass baking pan with foil, then grease the foil with nonstick cooking spray and set aside. In a small bowl, whisk together the flour, salt and baking powder. In a larger bowl, whisk the eggs until they're lightened, then add the brown sugar and flour mixture, stirring until almost completely mixed, then add in the nuts and dates. Scrape the batter into the prepared pan and bake until the top is just golden brown and a toothpick inserted in the middle comes out clean, 12-18 minutes. Let the bars cool completely in the pan before cutting into squares and store airtight up to 4 days. 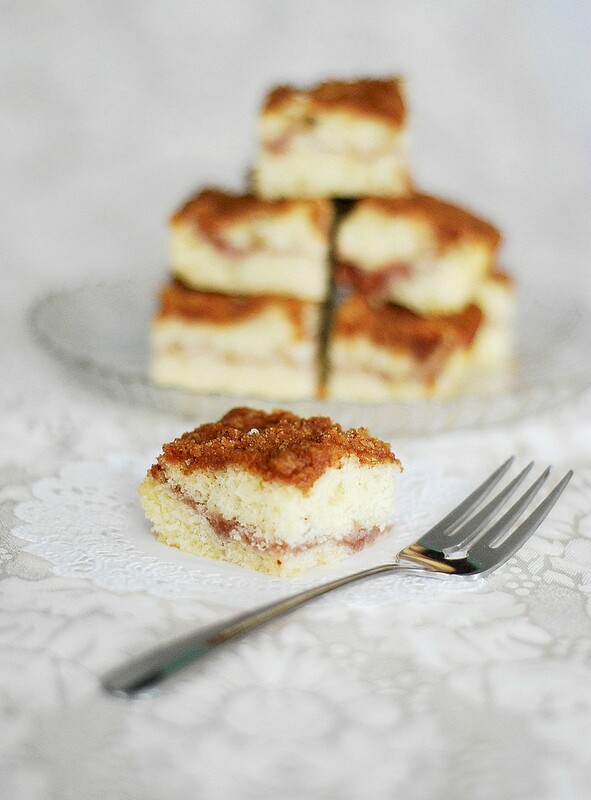 This recipe comes from Rebecca Rather's Pastry Queen book that I love. She says the recipe makes 12 large cookies or 24 smaller ones, but I easily got 140 little cookies out of this amount of dough! 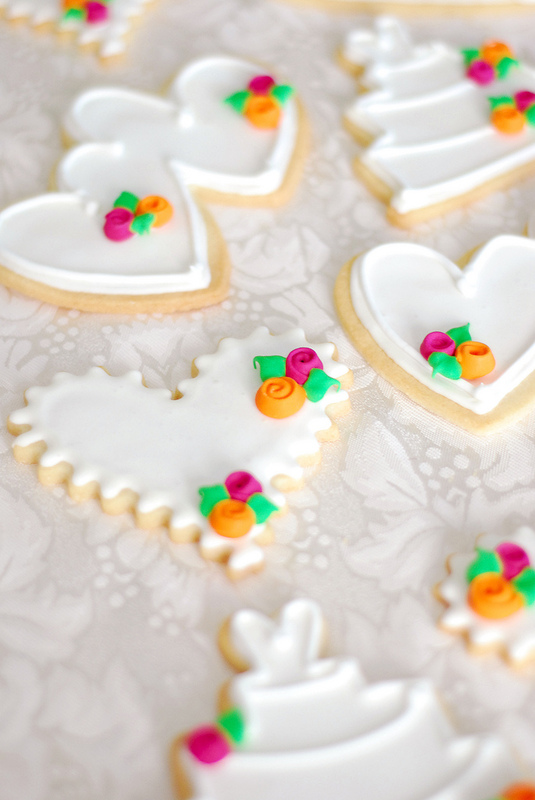 I love making little cookies, they're much more fun to eat. 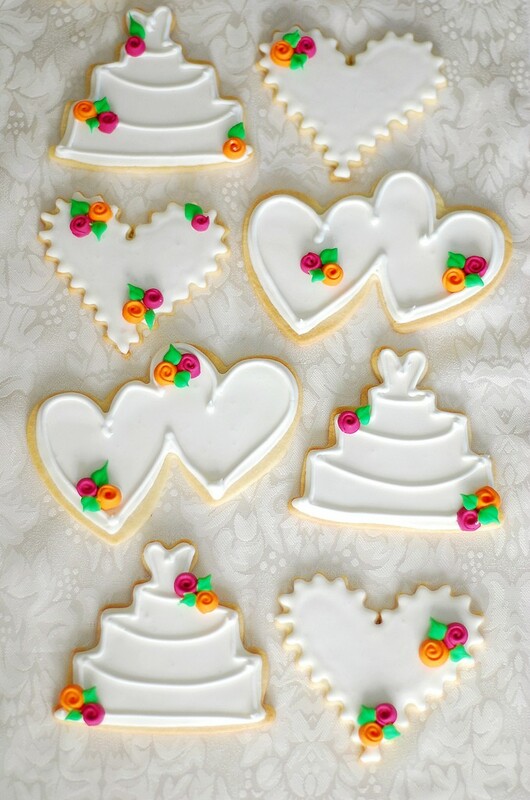 You can add lemon zest to the dough or dip the baked and cooled cookies in chocolate, I decided to sprinkle them with coarse decorating sugar for a little sparkle. 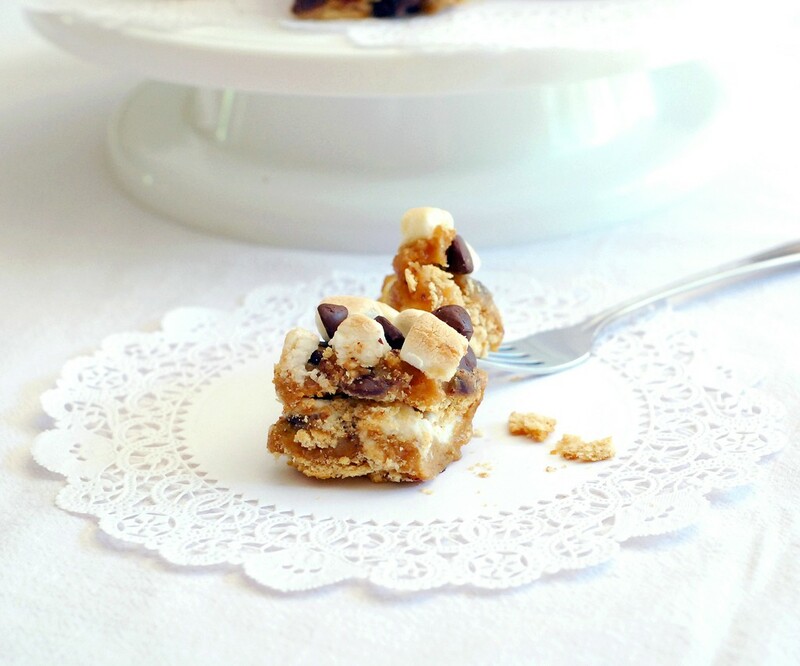 Either way, these are amazingly tender and addictive cookies that everyone will love. In a large mixing bowl, stir together the butter and oil until very light and creamy. Add in the sugars and mix to combine, then stir in the egg and vanilla extract. Add the flour, baking soda and salt all at once and stir until a smooth dough forms. Cover the dough and chill for at least an hour or up to 2 days. Preheat the oven to 350 degrees F. and line baking sheets with parchment paper. 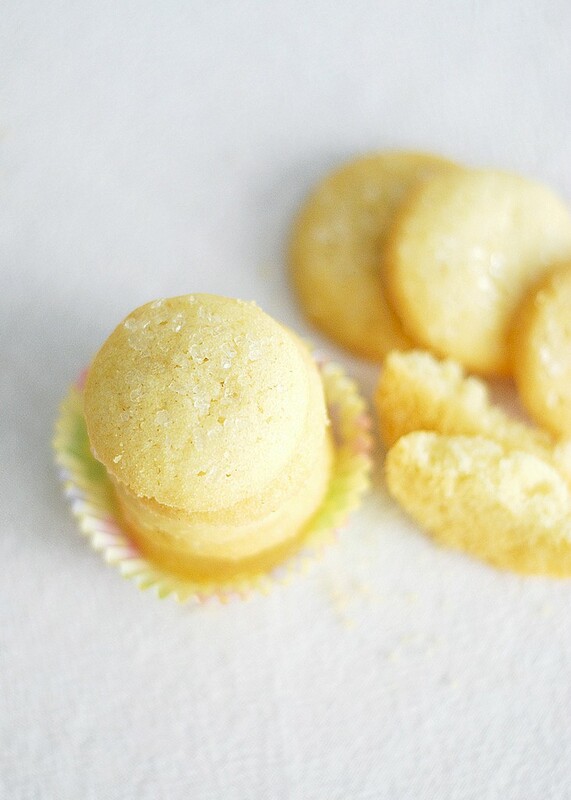 Scoop out little teaspoon-sized balls of dough and flatten slightly, then sprinkle with coarse decorating sugar. Bake until lightly golden brown around the edges, 8-10 minutes. Let cool completely on a wire rack, then store airtight for up to 5 days. A few days ago, my grandma came by with our first batch of zucchini from her garden. 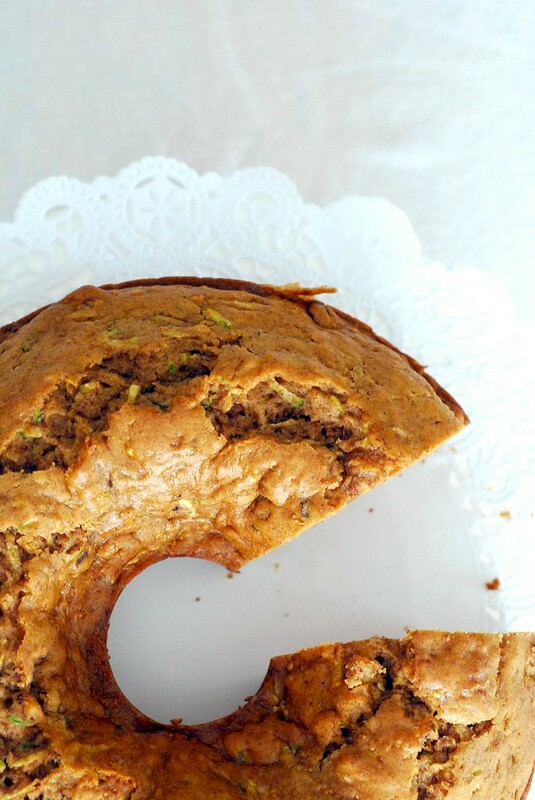 I knew as soon as it wasn't too lethal to turn on the oven that I'd be making zucchini bread! (P.S. I am loving this hot weather!!!) 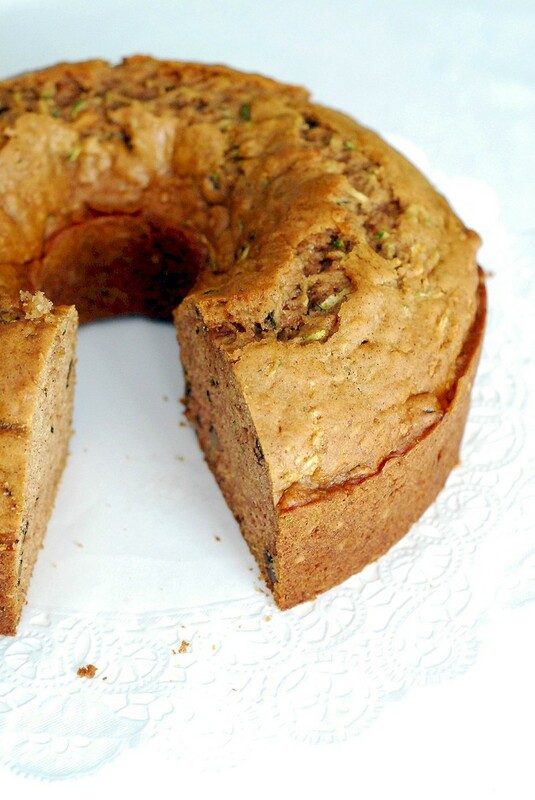 My mom has used this recipe for as long as I can remember and the smell of it baking always reminds me of summertime. Preheat the oven to 350 degrees F. and grease a 9 or 10" tube pan with cooking spray. In a large bowl, whisk together the flour, baking soda, baking powder, salt and cinnamon. In another bowl, combine the brown sugar, eggs and oil. 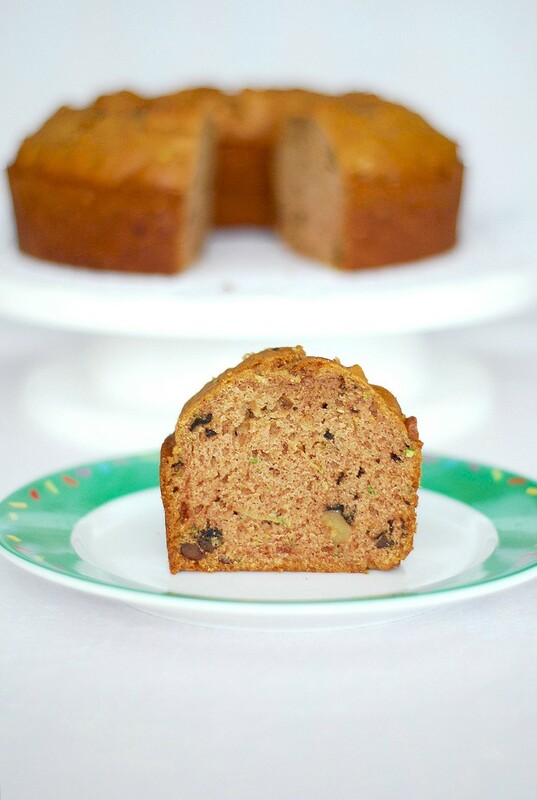 Stir the liquid ingredients into the dry ingredients until almost mixed, adding in the zucchini and walnuts at the end and mixing until just combined. Scrape the batter into prepared pan and bake for 45 minutes to an hour. It's done with the top has risen and cracked and a toothpick or knife inserted in the center comes out clean. Let cool in the pan for 20 minutes, then invert onto a cooling rack to cool completely before slicing and serving. This keeps well in an airtight container up to 4 days. For most of my life, one set of my cousins have lived in a different city from me. So when one of them gets married, it's a nice excuse to get together with everyone and catch up. Of course, it's also an excuse to bake! 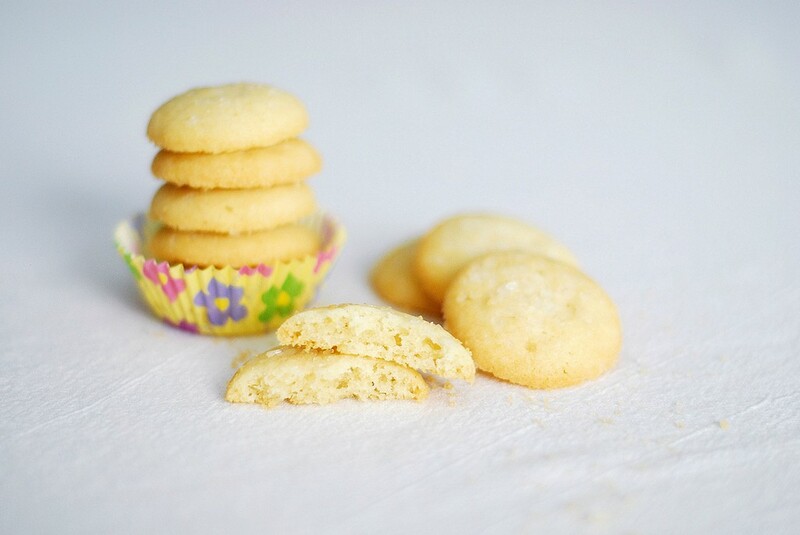 I did a bit of research before making these cookies and found that bloggers seemed to be raving over Peggy Porschen's sugar cookies. From pictures, they looked like they did not spread at all, and that's exactly what I wanted. I loved that the recipe was given in grams as well as cups, I just measured everything on the scale and then mixed. In a large mixing bowl, cream together the sugar and butter, then add the egg and vanilla. Stir in the flour until the dough forms, then wrap it in plastic and refrigerate for at least an hour. 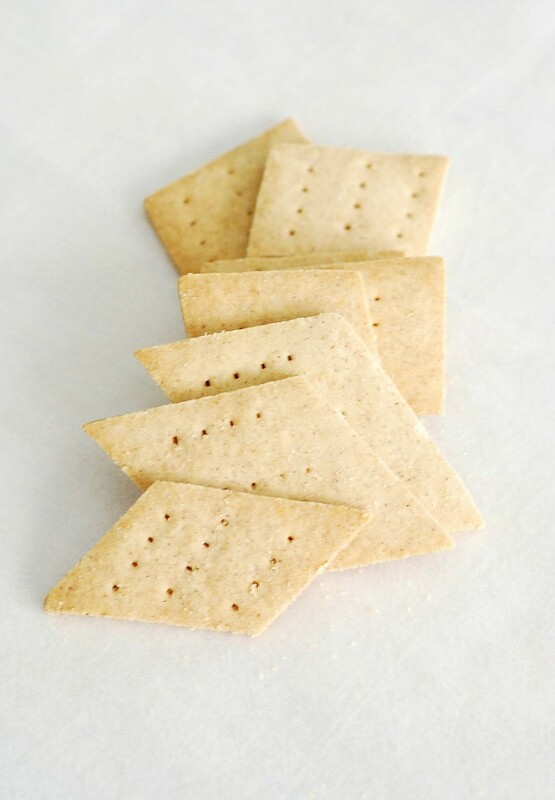 Roll out the dough to 1/4" inch thick, then cut out with desired shapes and place on parchment-lined baking sheets. Refrigerate the shapes for 30 minutes, or until they're firm to the touch. Bake in a 350 degree oven, until very light golden on the edges and set in the middle. Let cool completely before baking. These can also be frozen up to 2 months ahead of time. In a mixing bowl, combine the meringue powder and water, then whisk on high until soft peaks form. Add in the confectioner's sugar and beat until you have a desired consistency for either flooding or piping. 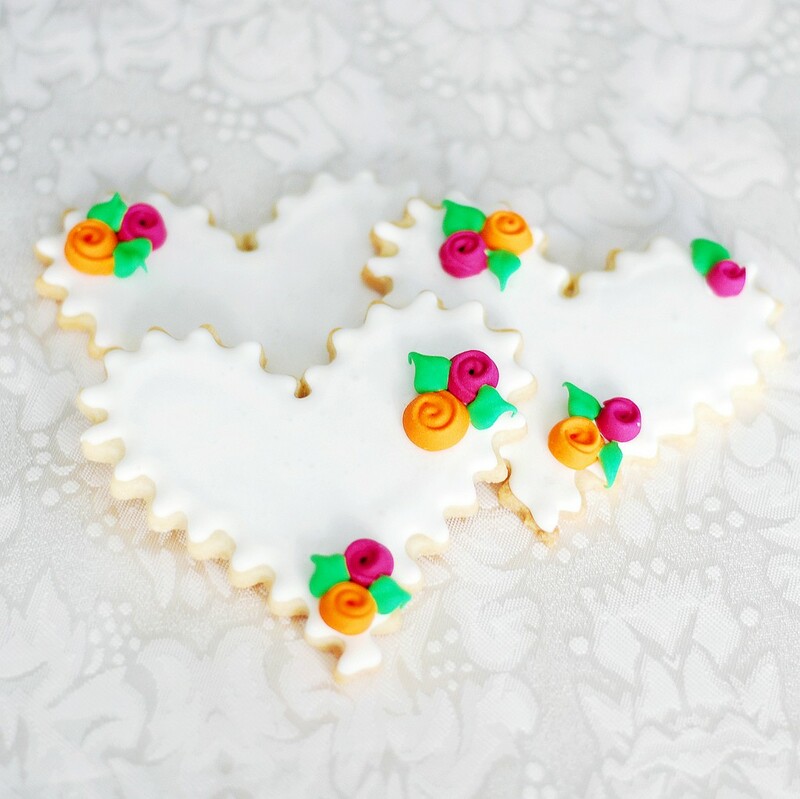 For the little icing roses on the cookies, I used royal icing, dyed it the two different colors, and followed the instructions somewhat on this site. 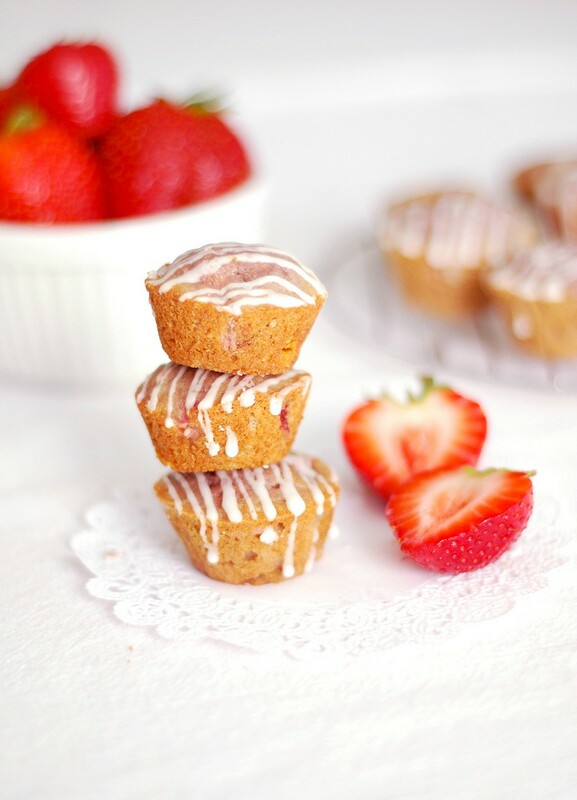 Mini Strawberry Muffins with White Chocolate Chips and Toasted Almonds. 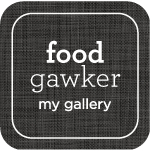 I LOVE fruit and generally I prefer to eat fruit raw. Especially juicy summer fruit - you don't need to add anything to it to make it any better, it's perfect as-is! But sometimes I go overboard at the supermarket and buy too much to handle. 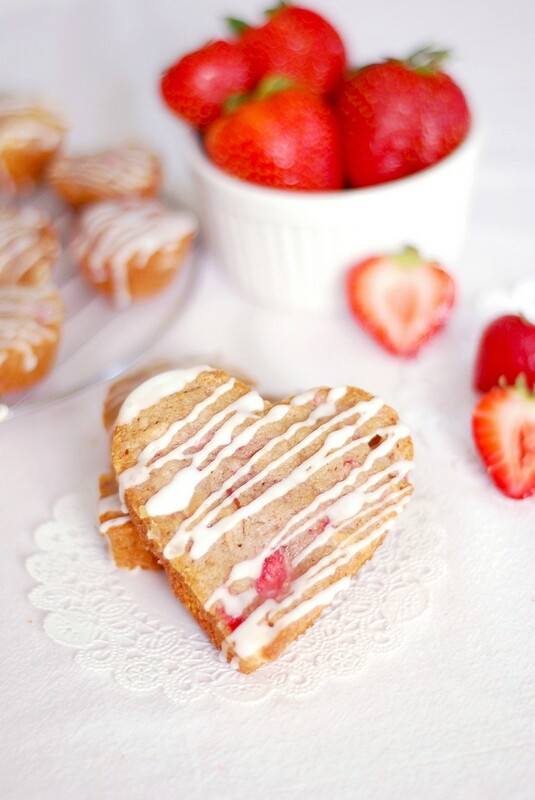 This morning while reaching for my morning egg, I saw the strawberries I bought last week getting pretty soft, too soft for a tart or any fresh presentation, so I found a strawberry bread recipe. The great thing about quickbreads is that you can divide the batter in any way you'd like - 9x5", mini loaves, cake pans (I did a few heart-shaped as you can see), and mini muffins. 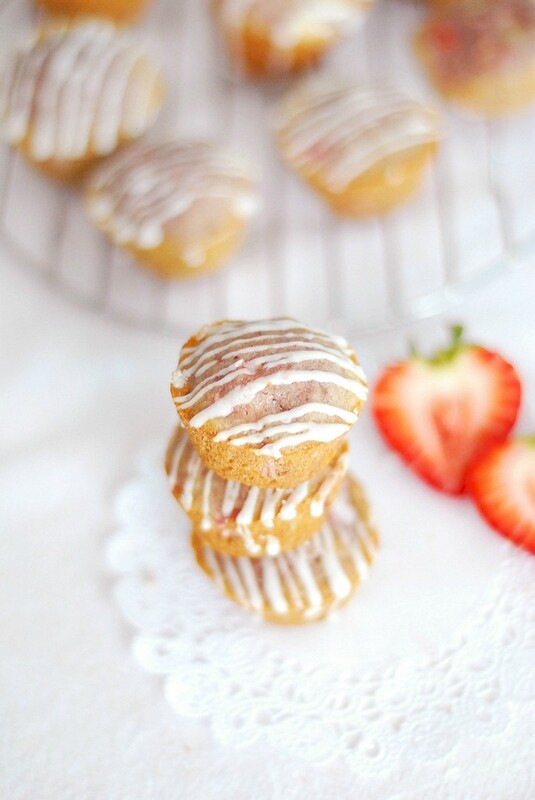 These adorable mini muffins are absolutely addictive and the drizzle on top adds just the right amount of sweetness along with the white chocolate chips in the batter. Preheat the oven to 325 degrees F. and spray 48 mini muffin tins with nonstick cooking spray or line them with cupcake papers. In a small bowl, whisk together the flour, baking powder, baking soda and salt, then set aside. In a larger bowl, cream together the butter and sugar until light and fluffy, then add the eggs one at a time. 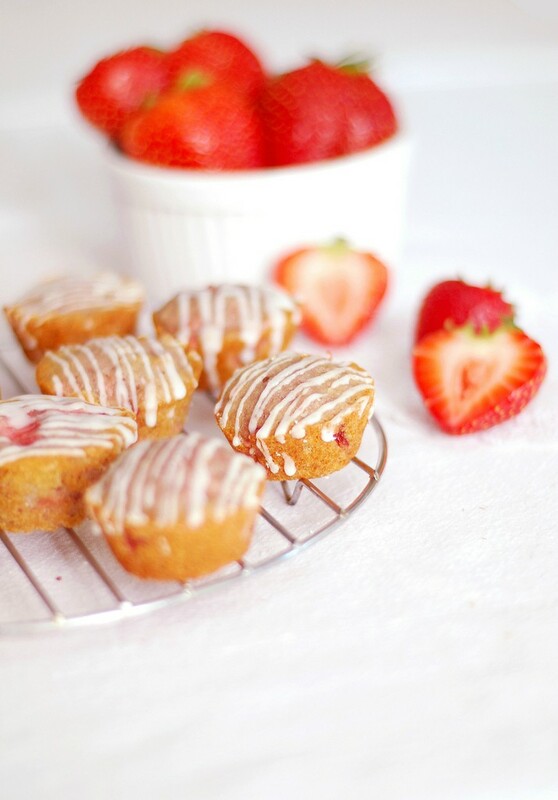 Mix in the vanilla extract, then the flour and strawberries alternately. 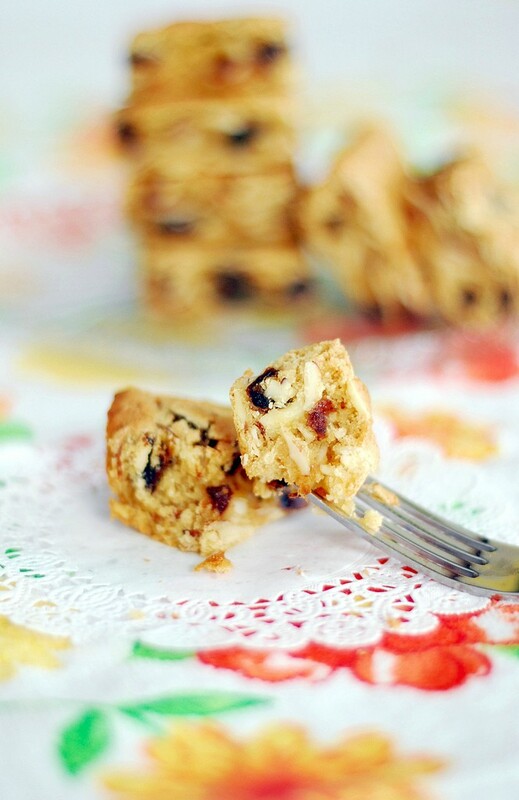 Stir in the white chocolate chips and almonds, then divide the batter among the muffin tins. Bake until slightly golden around the edges and set in the middle, about 15 to 20 minutes. 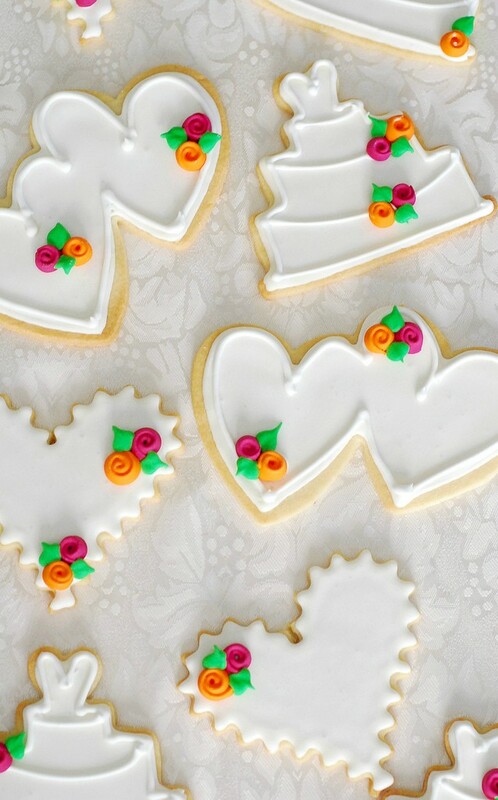 Let them cool completely before decorating with icing. 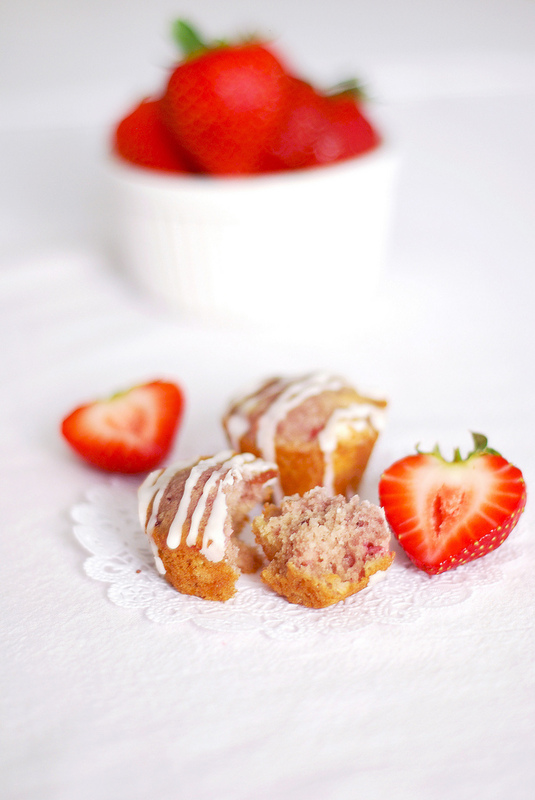 In a small bowl, whisk the sugar and milk together until it's a nice drizzly consistency, then drizzle over the mini muffins. 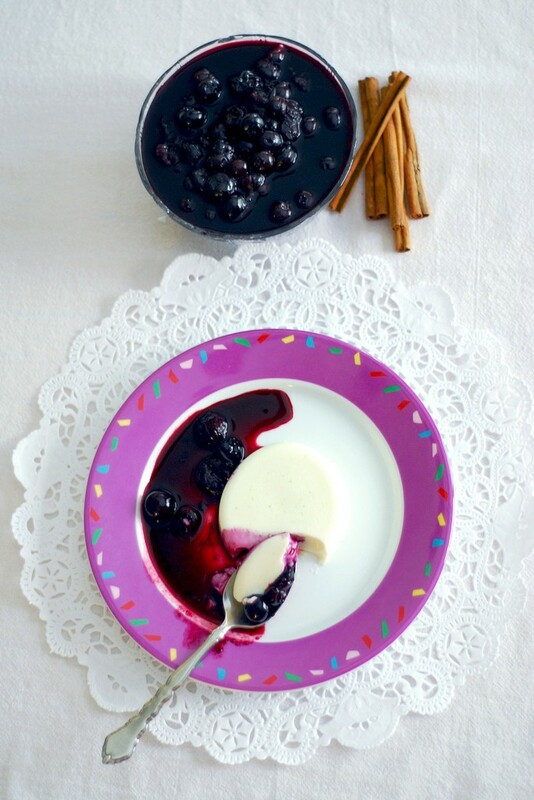 Cinnamon-Lime Panna Cotta with Blueberry Sauce. I originally set out to make a pie this weekend and then remembered I had more than half of a quart of half-and-half leftover from making my sister's cheesecake ice cream last weekend. 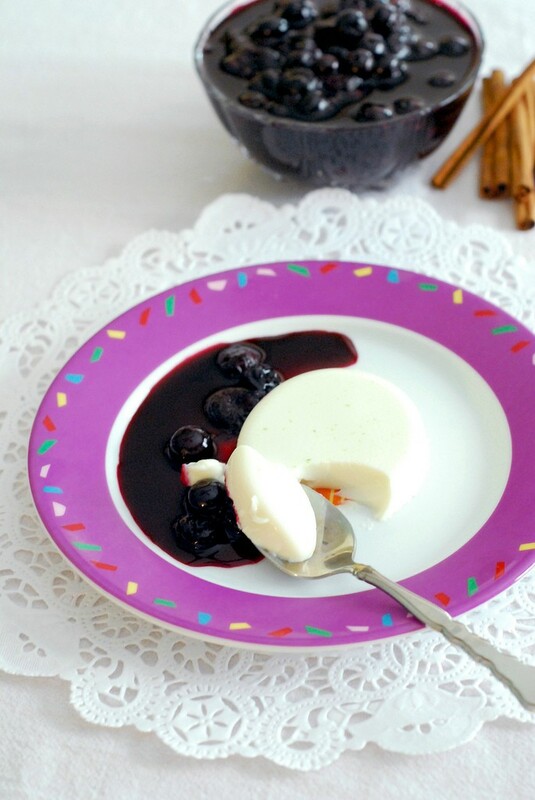 I browsed a few cookbooks before deciding on a panna cotta from David Lebovitz's Ripe For Dessert. 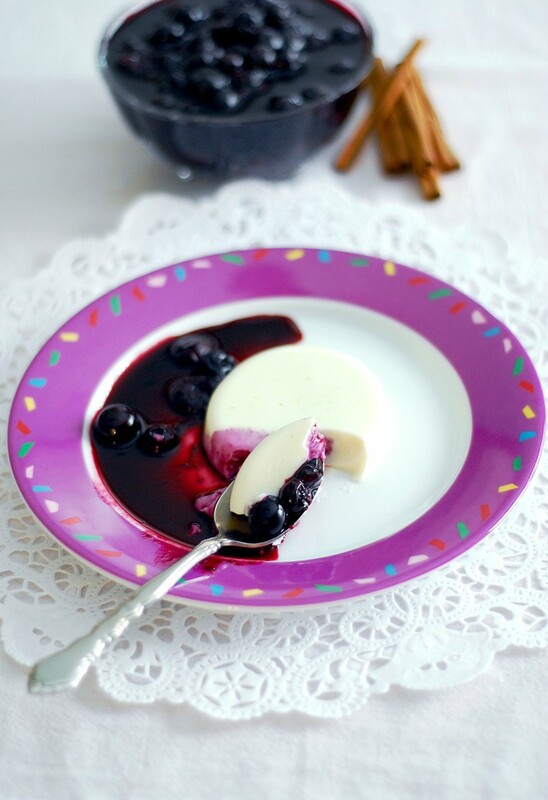 Panna cotta is a lovely summer desert. Served chilled, it's a refreshing and lighter alternative to richer and sweeter custards or puddings (although I can't say I prefer it, creme brulee will always be a favorite ;) I used blueberries as the accompanying sauce because they were what I had the most of and what the original recipe also calls for, but feel free to substitute any fruit you want. 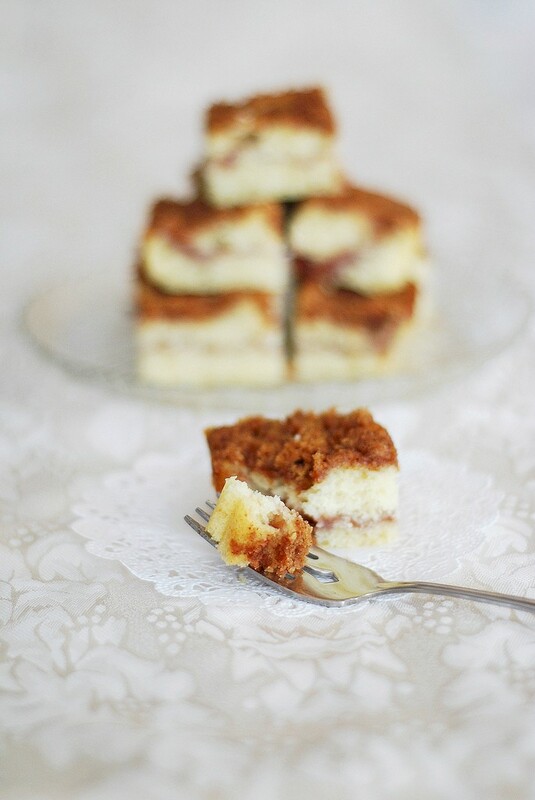 In a small saucepan, warm the half-and-half, sugar, zest and cinnamon sticks over medium heat until it begins to steam. Turn off the heat, cover the saucepan and let steep for a half an hour to an hour. In a medium bowl, sprinkle the gelatin over the cold water and let it soften for about 5 minutes. Rewarm the half-and-half mixture if necessary, then pour it through a strainer into the gelatin, whisking until it's smooth, and stir in the buttermilk. 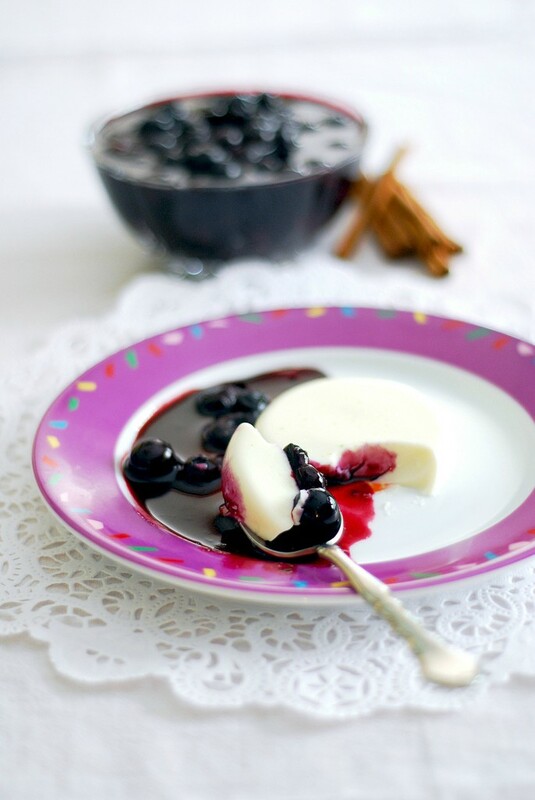 Lightly grease or oil 8 4-ounce ramekins and divide the panna cotta mixture among them. Refrigerate for at least 4 hours, or until firm. In a small saucepan, stir the blueberries, lime juice and sugar over medium heat, until most of the blueberries start to pop and release their juices. Cook until it boils and thickens slightly, then refrigerate. 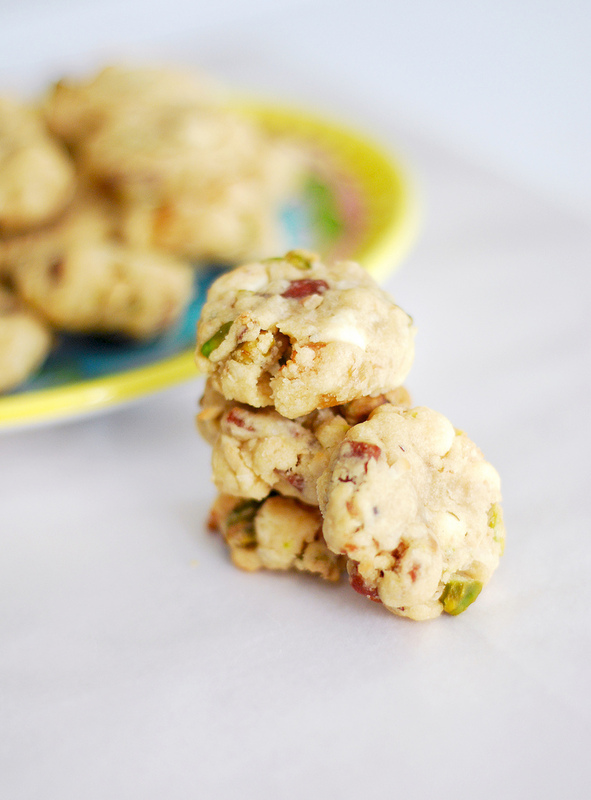 White Chocolate Chip, Pistachio, Coconut, Guava and Dried Pear Cookies. As crazy as these cookies sound from the title, they were out of necessity. I found a cookie recipe that sounded delicious but I didn't have all of the ingredients, so I used what I had and they were amazing. 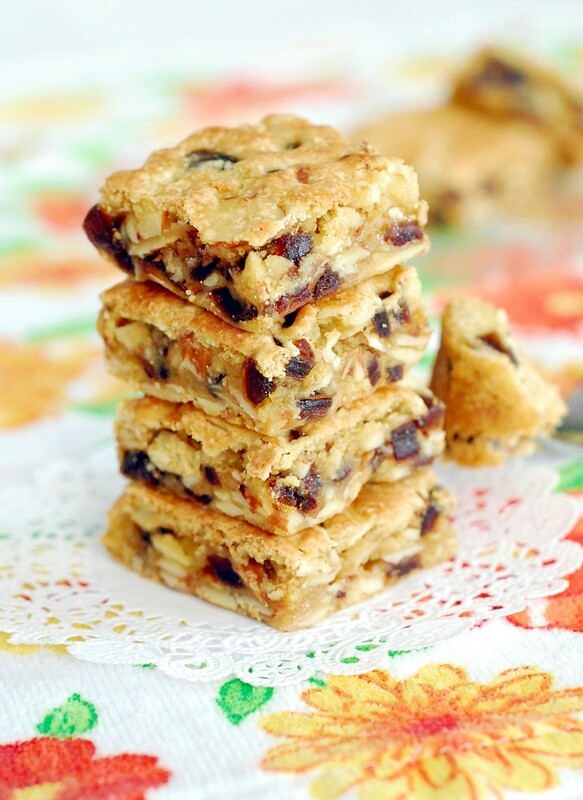 This makes a very compact cookie, just enough dough to hold everything together. But sometimes you don't want a plain cookie, sometimes you want a cookie stuffed with lots of good things from the baking cupboard. 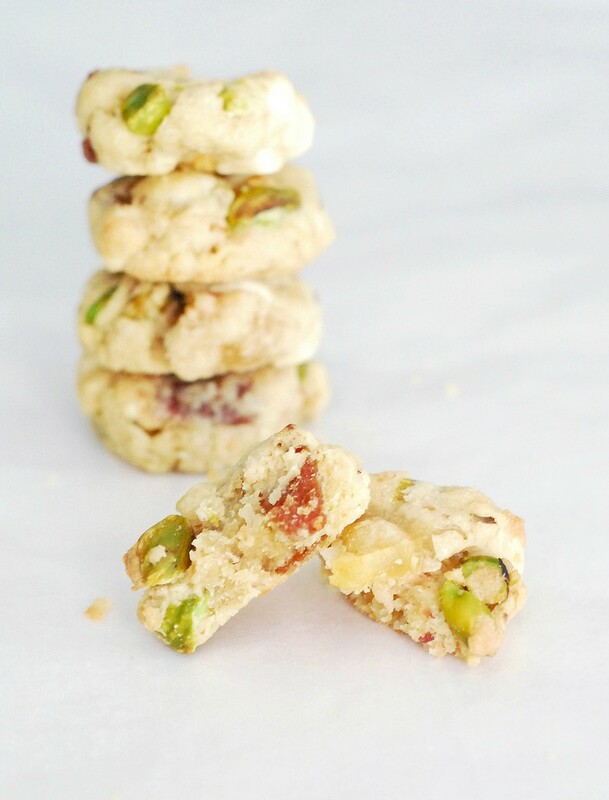 Feel free to use the dough as a base and use whatever additions you have - semisweet chocolate chips, any dried fruit or nuts that you have lying around and you need to use up - just keep amounts to the measurements called for. In a mixing bowl, cream the butter and sugar together until well-blended, then beat in the egg and vanilla extract. Whisk together the flour, baking powder and salt, then add to the butter mixture. Stir in all of your additions and mix well, making sure everything is evenly incorporated. Pinch off walnut-sized pieces of dough and roll it into a ball, packing tightly. Place the dough balls on the prepared baking sheet and flatten them slightly. Bake until they're just barely golden on the outside for chewy cookies, about 12-15 minutes, or longer for crispier cookies. Let them cool completely, then store airtight up to 1 week. 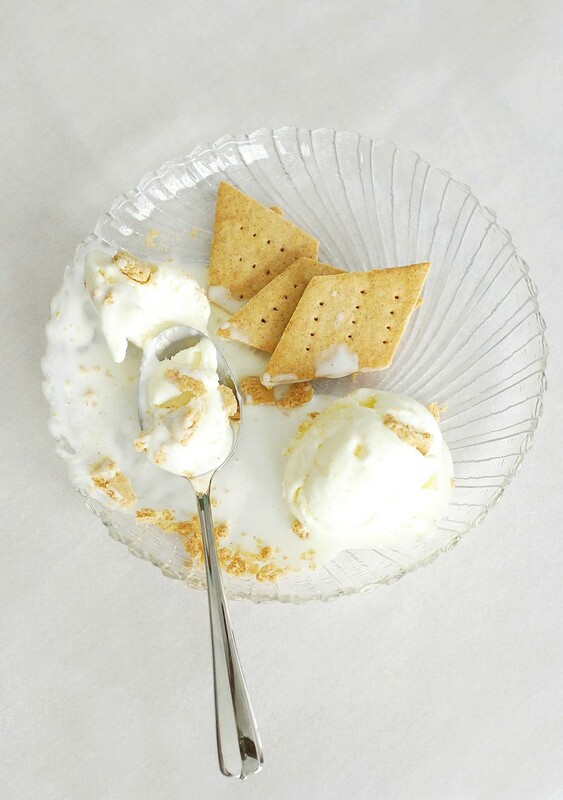 Cheesecake Ice Cream with Gluten Free Graham Crackers. A few years ago, after I graduated from culinary school, one of my gifts was an ice cream maker. I can't say I use it very often, maybe a few times per summer, but after making this ice cream I was reminded how amazingly easy and delicious homemade ice cream is. I made a cheesecake ice cream for my sister's birthday a couple of years back. She requested it again this year, but I decided to try a new recipe this time around. There wasn't anything wrong with the first recipe, but this one just seemed like it could be cheesecakier, I'm not sure why. Good news? It was! 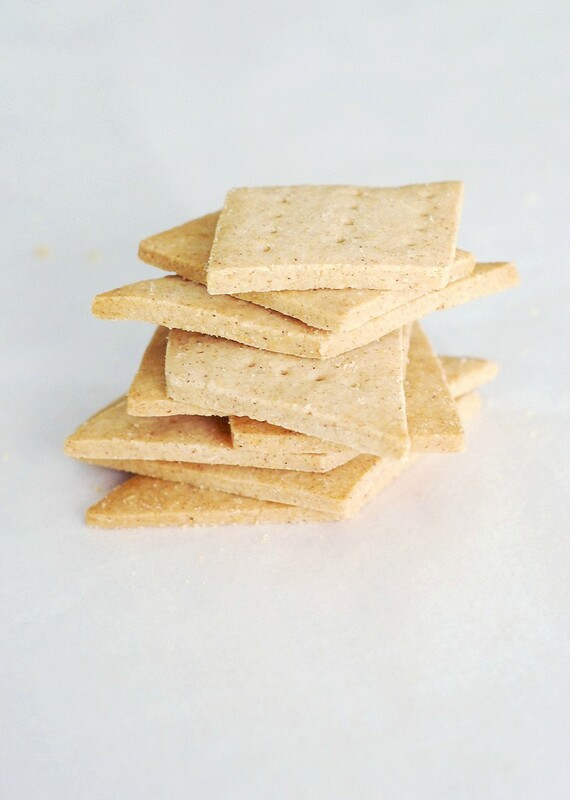 Graham crackers are cheesecake's perfect partner, so I made a gluten free version since we were expecting celiac guests. They came out beautifully tender and crisp, but not very sweet. If you're using them for something like crumbling over ice cream or crushing them for a crust, I would say use the recipe as-is, otherwise add some brown or granulated sugar to the dry ingredients. In a large bowl, cream together the softened cream cheese sugar, and lemon zest. In another bowl, whisk the sour cream, half-and-half, salt and vanilla together until smooth, then gradually add this to the cream cheese mixture. (Alternatively, you can just whizz everything together in a food processor. I didn't want to get it dirty @_@) Chill the ice cream base until very cold, at least 4 hours or overnight, then churn in an ice cream maker until thick and creamy. In a large bowl, weigh out all of the dry ingredients and whisk well to combine. Cut in the butter with 2 knives, a pastry cutter, or a fork until the mixture resembles sand. Stir together the honey and water, then add it to the dry ingredients, stirring until the dough just starts to come together. Knead it a few times, then wrap and refrigerate for an hour. Preheat the oven to 350 degrees F. and line a baking sheet with parchment paper. Roll the dough out to about 1/4" thick, then score diamonds or other shapes with a knife and use the tines of a fork to poke holes in the shapes, if desired. Refrigerate the dough until cold, then transfer the shapes to the baking sheet and bake until light golden brown on the outside, 12 to 20 minutes, depending on how thick or thin you cut the dough. Isn't it amazing how much can change in so little time? Today is America's birthday, the 4th of July. It's a beautiful summer day here and I can only hope the rest of the summer will be as nice. But how do you embrace the beauty of things you love when you and the one you love have decided to take some time to be apart? It hurts too much to even think about going about normal day-to-day right now, but there must be ways to cope. This is how I cope. I bake. 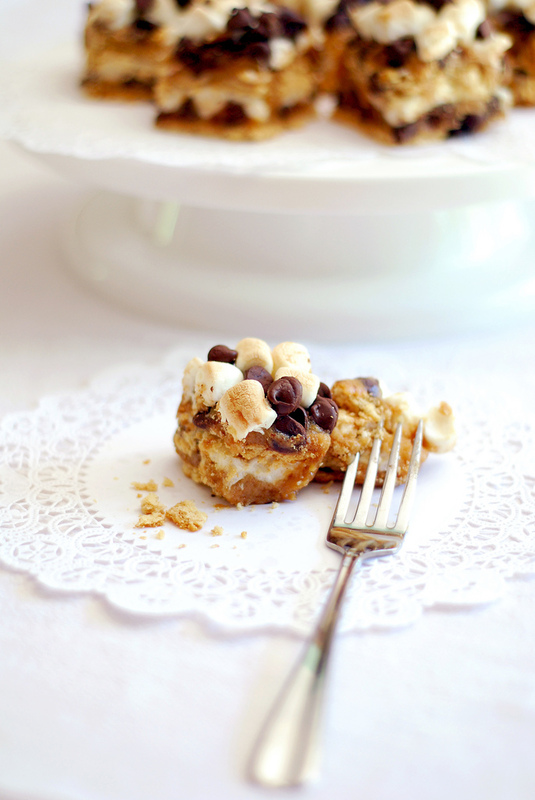 I bake things with chocolate and gooey marshmallows and comforting graham crackers. 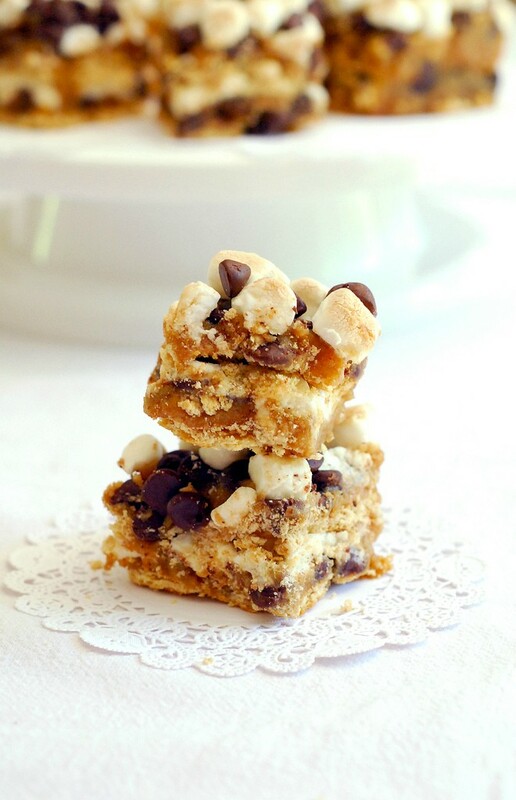 Of course, these just also happen to be perfect for the 4th of July since they ARE s'mores, after all. I realize by the time this recipe goes up, no one will see it before their celebrations, but I promise they're still amazing any time, anywhere, anyhow. Preheat the oven to 350 degrees F. and spray an 8x8" or 9x9" pan with baking spray and layer about 4 1/2 graham cracker halves over the bottom of the pan. In a small saucepan, melt the butter. Stir in the brown sugar, milk, vanilla extract and graham cracker crumbs and spread half of this mixture over the graham cracker layer. 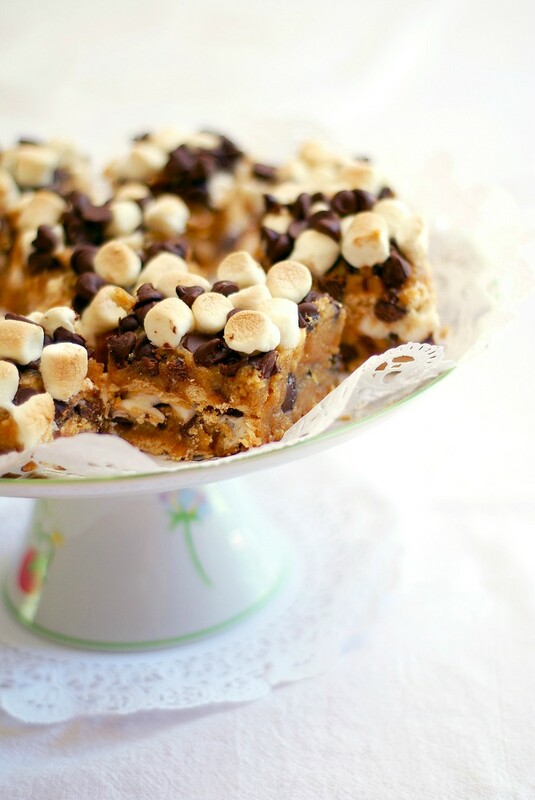 Sprinkle with about 1/3 of the chocolate chips, then half the marshmallows. Top with another layer of whole graham cracker halves, then the rest of the butter mixture. Sprinkle another 1/3 of the chocolate chips on top, the rest of the marshmallows and then finish with the rest of the chocolate chips on top. 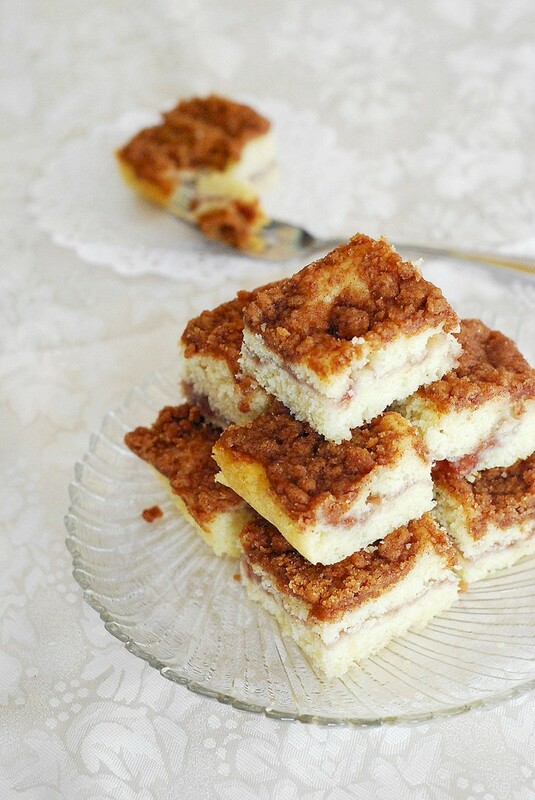 I'm off to help devour some Caribbean jerk barbecue chicken, boiled salt potatoes, cole slaw, cold juicy watermelon and these s'mores bars with my family. I hope everyone out there has a great holiday and here's hoping to a soothing and therapeutic summer.